With customer centricity the rallying cry for today's retailers, retail organizations must create the systems that support instant, highly personalized and targeted decisions across multiple channels. Key to successful customer-centric decision making is sharing consistent insights and business rules across all business functions that touch the customer. 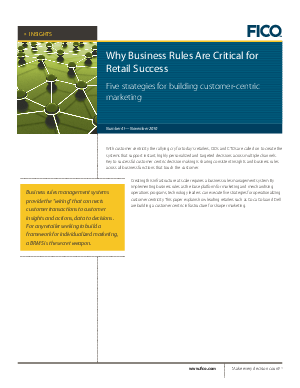 In this white paper, FICO shares best practices on how successful retail organizations are using business rules management as the base platform for marketing and merchandising operations programs in order to achieve customer centricity. This white paper includes case studies illustrating how Coca-Cola and Dell are building a customer-centric infrastructure that is driving business results.